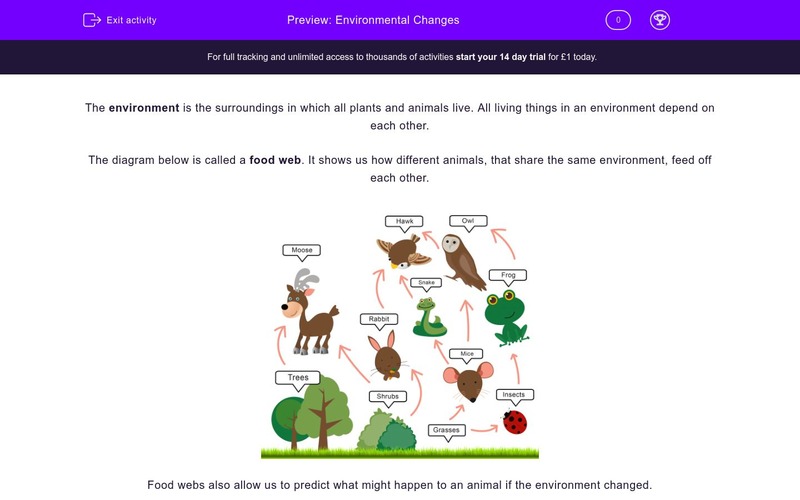 In this worksheet, students use their knowledge of the impact of environmental change. The environment is the surroundings in which all plants and animals live. All living things in an environment depend on each other. 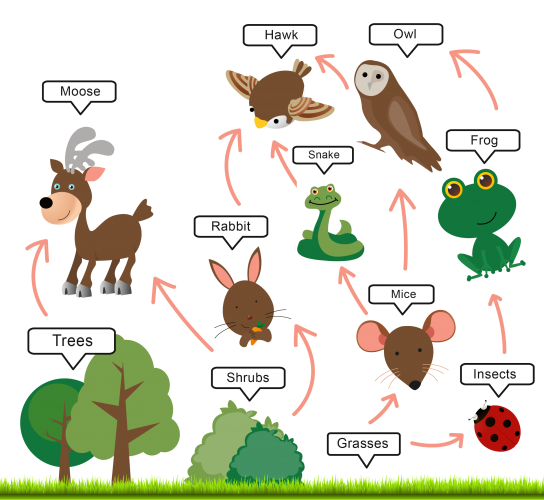 The diagram below is called a food web. It shows us how different animals, that share the same environment, feed off each other. Food webs also allow us to predict what might happen to an animal if the environment changed. If we change our environment, by building something or digging something up, it can be quite dangerous for plants and especially animals. Take a closer look at the food web. Imagine that the grass is actually a school playing field which is used by the students to play sports on. As a result the grass is cut regularly and is very short. Mice like to look for food in long grass. What might happen to the number of mice that live near this field? Let's look at that food web again. If the population of mice decreased, what might happen to the population of frogs? It would go up because the insects would be able to get more grass and so there would be more food for the frogs. Nothing, it would stay the same. It would go down because the owl wouldn't be able to eat mice as often and would have to eat more frogs instead. 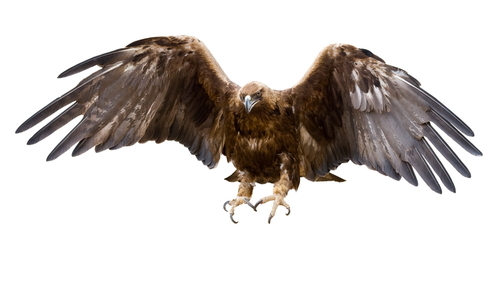 Golden eagles prey on small mammals such as hares, rabbits and even lambs. Since 1800, the golden eagle population in England has been reduced to just two birds which live in a protected part of the Lake District. Can you think of a reason why the number of golden eagles in England has reduced so much in the last 200 years? Acid rain has damaged their nests. Another, bigger eagle is taking their food. Farmers have been shooting them illegally. It's too warm in England, they prefer it in Scotland. Filey Brigg in East Yorkshire is very famous for its rock pools and the wildlife that lives there. Shellfish live in the rock pools where they feed off seaweed. Crabs and starfish eat the shellfish, while crabs and starfish are eaten by seals and seagulls. 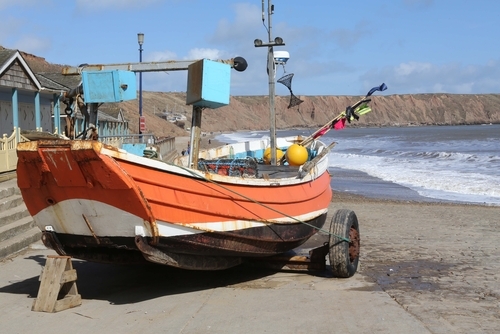 If this fishing boat accidentally polluted the waters around the brigg causing the shellfish to die off, what might happen to the amount of seaweed? It would stay the same. 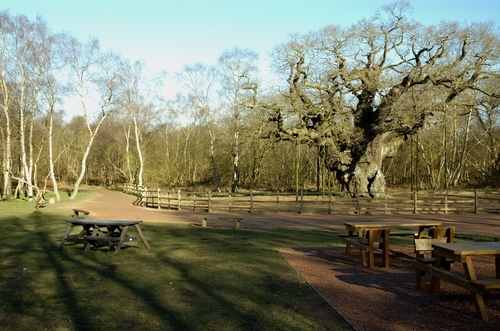 Some trees like this old oak tree have protection orders on them. This means you are not allowed to chop them down unless it is dying and becoming dangerous. Can you identify four animals that might depend on this tree for survival? 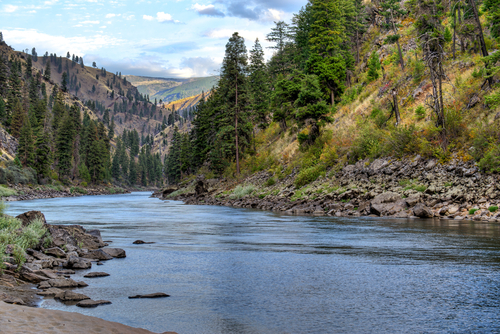 Can you identify an animal that might live in this river? Sheffield is famous for producing steel. It used to have many factories along the river, and it was one of the most polluted cities in Britain. Salmon lived in the river in Sheffield when the pollution was really bad. The dodo was a pretty useless bird; it couldn't fly and it wasn't very intelligent. It became extinct nearly 300 years ago. Humans are thought to be directly responsible for its extinction. Apart from shooting the dodo for food, can you identify two other ways we caused the dodo to become extinct? Humans are directly responsible for all the animal and plant species that have become extinct. Environmental change is always the reason why an animal or plant species may become extinct. Field mice are important sources of food for bigger animals like me (an owl). If the number of field mice in an environment decreased how might that affect us owls? Sometimes the decline of one animal in an environment can affect others too. Sadly, the biggest reason for the huge drop in the number of golden eagles has been because farmers and gamekeepers shoot them and disrupt their nests. This happens for a few reasons, and not just because golden eagles have been known to enjoy the odd leg of lamb. The major reason is that golden eagles also eat a small bird called grouse. Some farmers and gamekeepers breed grouse for humans to hunt and shoot. The hunting season is very big business for some farms and big country estates. If the golden eagle eats the grouse the humans will have nothing to shoot, so the farmers and gamekeepers shoot the eagles instead. Although the pollution might also affect the seaweed, we can assume that if fewer shellfish are eating the seaweed then its amount would increase. The caterpillar and the ladybird eat the leaves of the tree, the deer eats the acorns that the tree produces and the hawk will build its nest in the tree. This was an easy one. But it's quite important that you understand that salmon only live in clean water which has lots of oxygen in it. The river Don in Sheffield, like the Thames in London and the Tyne in Newcastle, was one of the most polluted waterways in Europe. In fact at one point the pollution was so bad the river became yellow! The wildlife that lived there was badly affected by the pollution and lots either died or migrated to other waterways. 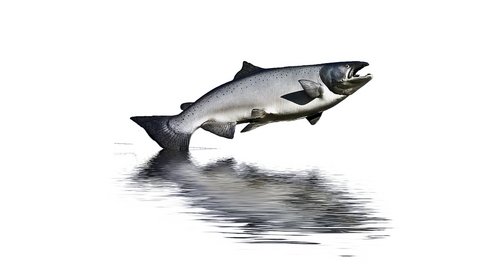 Thankfully the rivers are now much cleaner and fish like salmon are returning and breeding. 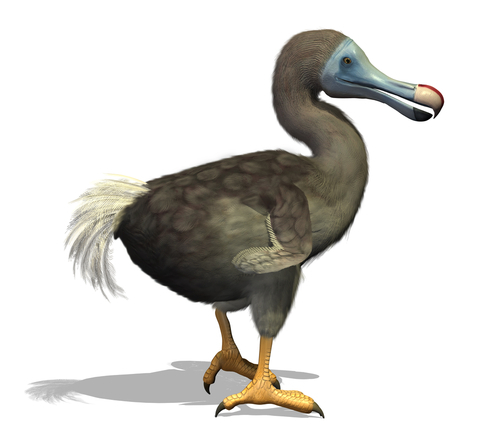 The main reason the dodo became extinct is because we changed its environment by chopping down the forests where it lived and introducing animals into these areas which would either eat the dodo or compete with it for food and shelter. Some species like the dinosaurs became extinct long before humans arrived on the planet. However, one factor is always to blame for the extinction of a species. Can you think of it and of a better way of wording this statement? Take a look at the next question. When an animal becomes extinct or endangered, it's because it cannot adapt to changes in its environment. These changes may be man-made or natural.